Q1. I want my child to go to one of the parish schools. How do I know if I am in the Parish ? A. The highest priority is given to Catholic children living within our parish. This is determined by geograpichal location, referred to in the Admissions Policies as the Parish Boundary Map. Copies of this are on display in school offices, and for convenience a downloadable version is included below. There is the Map on its own, and then the Map with street descriptions. This was approved in March 2011 and supercedes all previous versions. Q2. I've not been to Church for a while and my child's not been christened. How can I get him "done" ? A. We welcome every request for Baptism, but remind parents of the responsibility and commitment required in order to make the passing on of our faith to children fruitful for them and for the Church. Full details are included in our Baptism Guidelines included in the Saraments section. Q3. When I've been to Mass on Sunday, I've noticed people putting coloured envelopes into the collection. What are they ? In common with all other parishes, we rely on the generosity of all parishioners to help make our parish financially viable or sustainable. There are many expenses associated with running the parish, not least heating, insuring and maintaining our two Churches and Parish Centres. 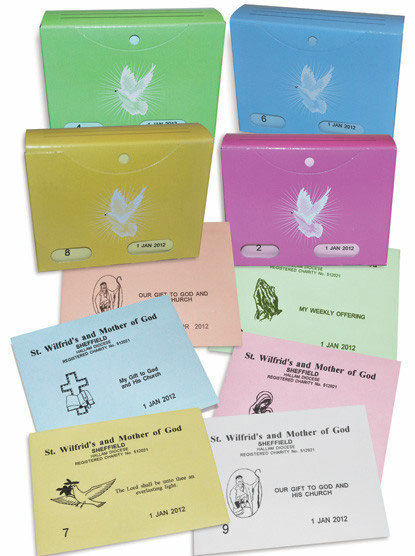 The coloured envelopes are Weekly Offering Envelopes, one positive way parishioners can regulalry contribute to the parish. Each set has a number which corresponds to the name and address details of the donor held confidentially in the parish. For donors who pay tax and have signed a Gift Aid Declaration form, the parish is able to reclaim tax from the HMRC. 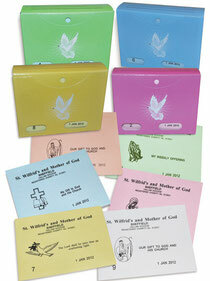 Envelopes allow parishioners to donate their envelopes at whichever mass they attend. For example, someone from St Mary's might be going to the Vigil Mass at St John Fisher so the envelope donated there would be counted with the St Mary's collection. The envelopes also allow donors to bring in two or three weeks together if, for example, they have been away for a holiday. Q4. A neighbour has died and she was a Catholic. What is a "Mass Card" and how do I get one ? The daily celebration of Mass by the Church, its priests and the faithful is a response to the command of Jesus himself at the Last Supper: "Do this in memory of me..." Every Mass, therefore, whenever and wherever it is celebrated is offered for the salvation of all humankind. It is the Church's most powerful prayer echoing through the centuries. Within this wider context, the Church's long tradition has been for the faithful to ask priests to celebrate Mass for a particular intention, for example, for a recently deceased person, to mark an Anniversary, for someone who is sick. Historically this has been accompanied by an offering (or "stipend") from the faithful to contribute to the support of the Church's Ministers and the fulfillment of the Church's apostolic activity. A Mass Card is available cheaply from the Piety Stall (many are 40p or 50p), which is then signed by the Priest as a commitment to ensure that Mass is celebrated for the particular intention. The card is then passed to the family of a deceased person, for example, reassuring them of this spiritual support. The offering to the priest in most cases is an offering to support the work of the Parish, and ranges from the £2 minimum stipend specified by the Bishops to larger amounts according to the means of the donors. As more Mass offerings are often received than an individual priest is able to celebrate, other priests may be asked to celebrate Mass for these intentions. In our Parish, a number of offerings are passed to priests on overseas missions to support their work. Q5. I've not being coming to Church because I'm worried about the noise my baby makes. What should I do ? All are welcome to join in our celebration of Mass, from the very youngest to the very oldest parishioners. We all gather as a family with shared responsibilities and shared rights. We all have a responsibility to pass on our Catholic Faith to the generations which follow us. We all have a responsibility as the People of God to participate actively in the celebration of Mass. We have a right to hear God's Word and stand in God's Sacred Space. To help parents with baby children, at the back of St Mary's Church, there is a small room to the right just before entering the main body of the Church. This is sound-proofed to allow people to see into Church, and an internal speaker to allow people to hear. Parents may feel free to use this room if a child is particularly agitated. Children grow up quickly and space is limited, so children who have entered the Nursery Class at school should already be too old to need to be in this room. At this age, they should be being introduced to the routines of joining older children and adults in the main body of Church. At St John Fisher, there is plenty of space with seats and tables in the Welcome Area to tend to the needs of our baby children. Toilet facilities are located in the adjacent Parish Centre.